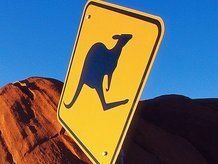 Project Kangaroo, the much-mooted online link-up between the BBC Worldwide, ITV and Channel 4, has been blocked by the Competition Commission. In a statement, Peter Freeman, Chairman of the Competition Commission, said about Project Kangaroo: "After detailed and careful consideration, we have decided that this joint venture would be too much of a threat to competition in this developing market and has to be stopped." The news will come as a blow for those who want a service like Hulu.com in the UK, where TV shows, regardless of who distributes them, are accessible online from one website. As expected, the broadcasters involved with Project Kangaroo are not happy with the ruling. A joint statement released by all involved, said: "We are disappointed by the decision to prohibit this joint venture. "While this is an unwelcome finding for the shareholders, the real losers from this decision are British consumers. This is a disproportionate remedy and a missed opportunity in the further development of British broadcasting." Michael Grade, the Executive Chairman of ITV, was also surprised with the ruling but insisted: "In the two years since the idea for Kangaroo was born, the success of ITV.com has proved that our UK content is attractive enough to stand on its own and we remain focused on our online growth."